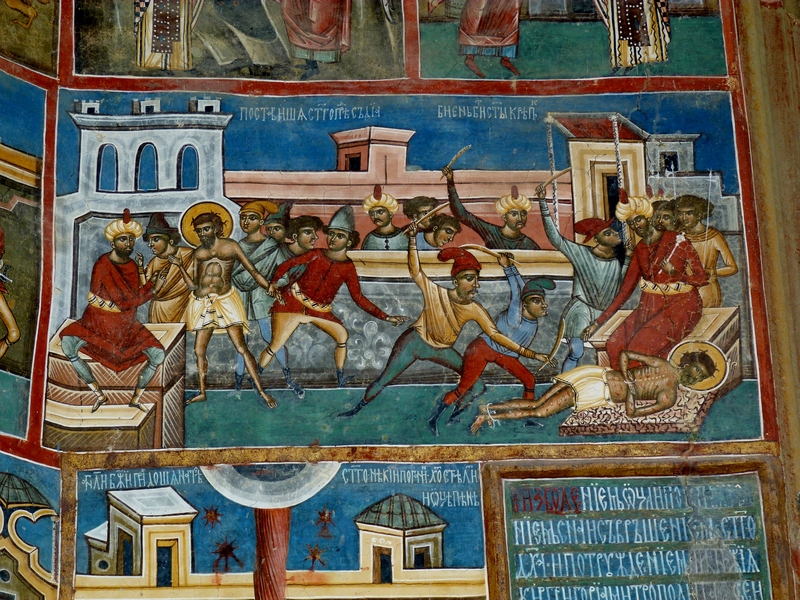 The painted Arbore Church was dedicated to ‘The Beheading of St. John the Baptist’ by its patron who, in a cruel twist of fate, was later himself beheaded as were his two sons, accused of betrayal, on the orders of Stephen the Young. In late May we cycled from Budapest in Hungary to Bucharest in Romania. 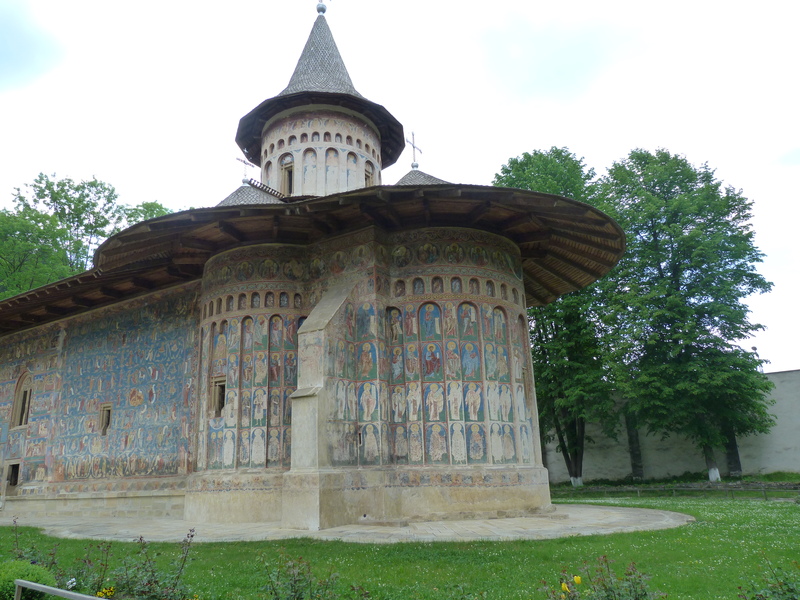 We had no particular route in mind except that I wanted to visit the Painted Monasteries in Bukovina which is in the North Eastern corner of Romania next to the Ukrainian border. 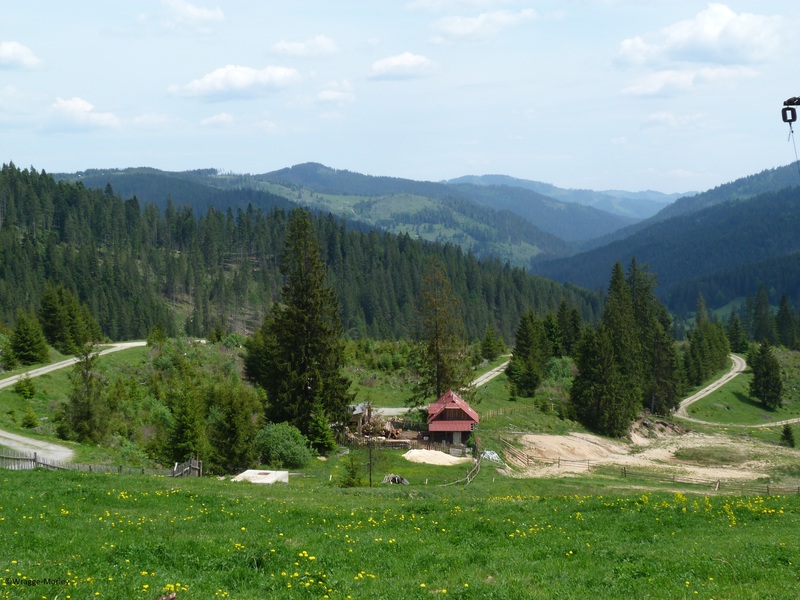 Bukovina is a beautiful region with breath taking scenery, rolling densely forested hills and verdant valleys containing rural villages. 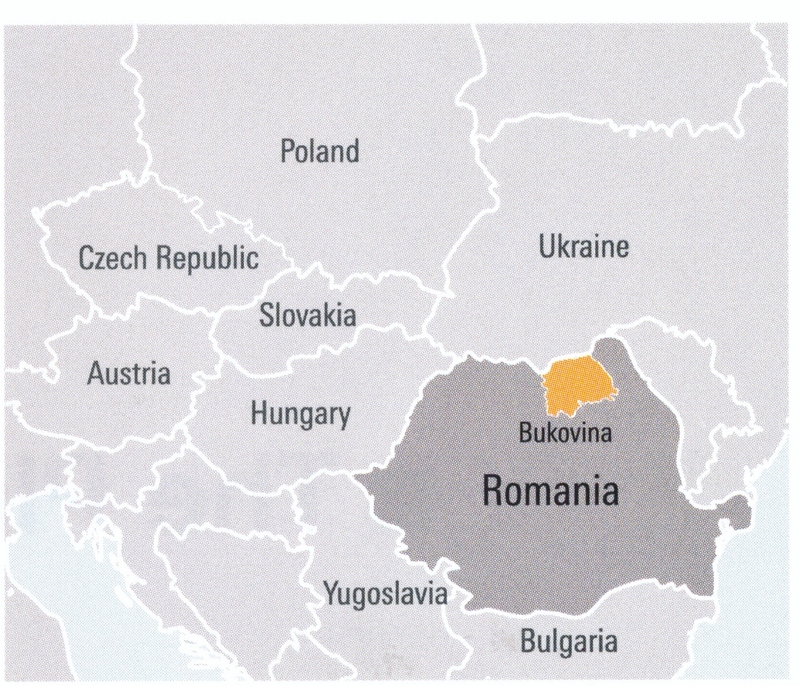 Location of Medieval Monuments of Bukovina. The Medieval Monasteries and Churches of Bukovina are now included in the World Heritage List of UNESCO and are spread throughout the east of the region. 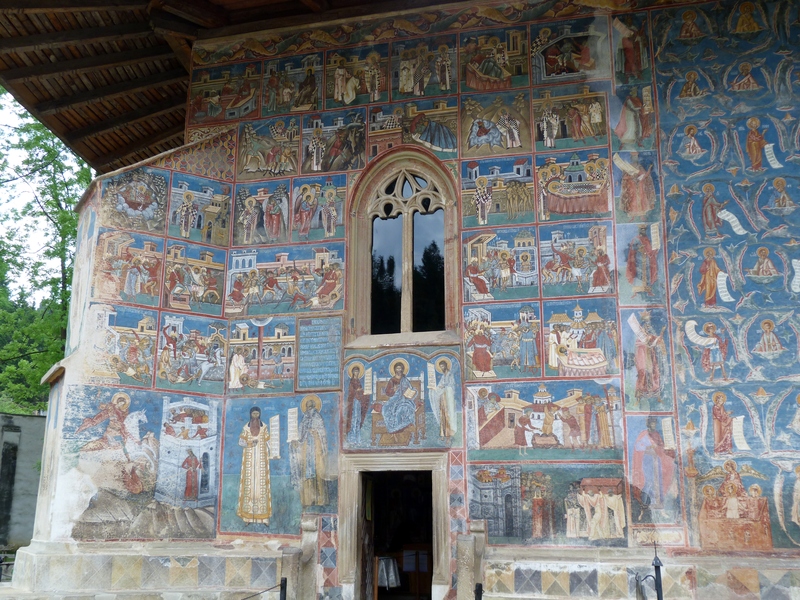 We visited four of the sites; Voronet Monastery, Humor Monastery, Arbore Church and Probata Monastery. We cycled up a tree lined lane to Voronet Monastery quite late in the day, so there were no other visitors. Originally all the monasteries were built in secluded, forested spaces where the monks could retreat and the nobility and common folk alike could hide during periods of unrest or invasion. Now villages and towns have grown up around most of them. Voronet is probably the most visited as it is one of the best preserved and renovated of the monasteries. As it was the first one we had visited I was overwhelmed by the extent and intense colour of the murals both on the outside and inside of the building. 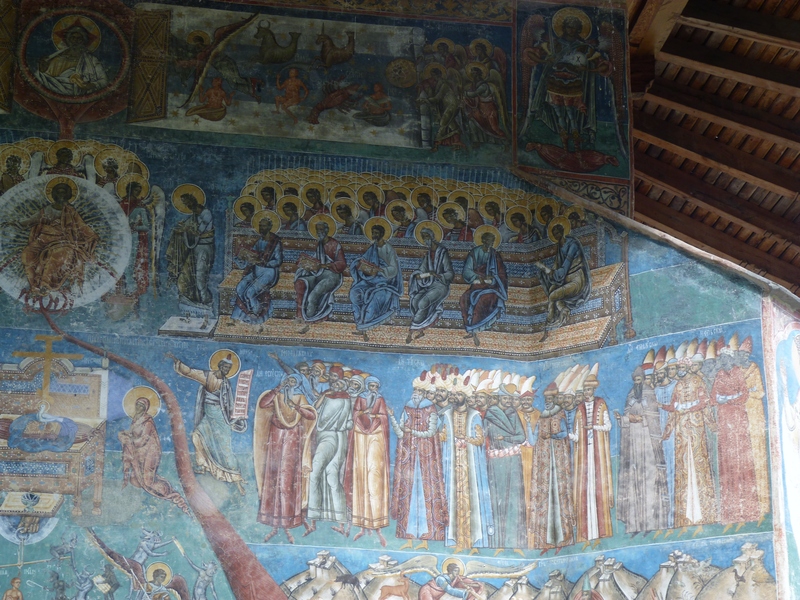 In fact the colour Voronet Blue was named after this monastery. Despite this I later found that I preferred some of the other less visited and less restored sites that had a more peaceful charm about them. 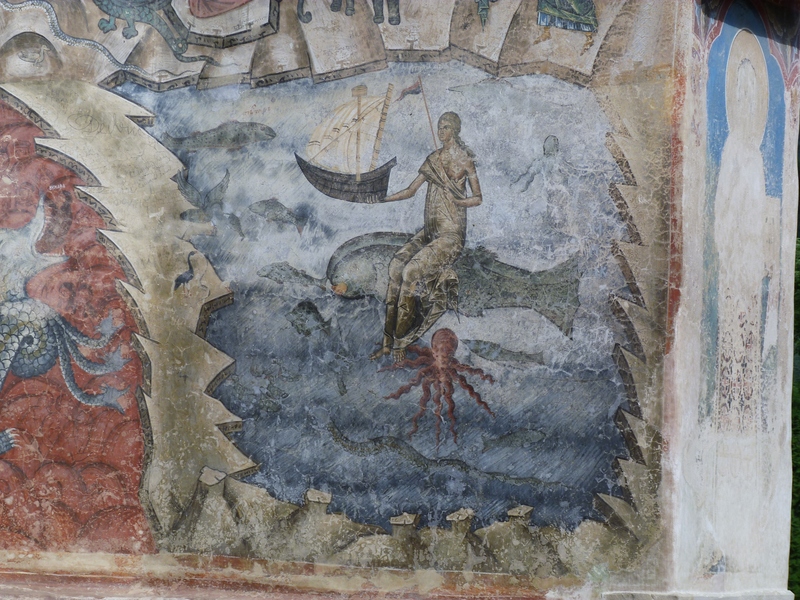 It is sobering to realise that these murals were painted around 1496 with is 12 to 15 years before the Sistine Chapel ceiling was painted and that some of these murals have survived exposed to the elements on external walls. 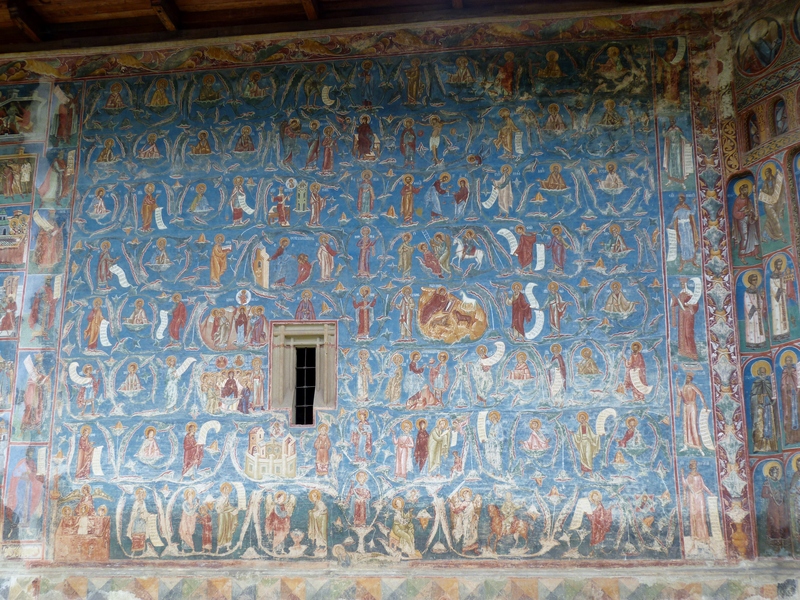 The most spectacular external mural at Voronet is The Last Judgement on the west façade. 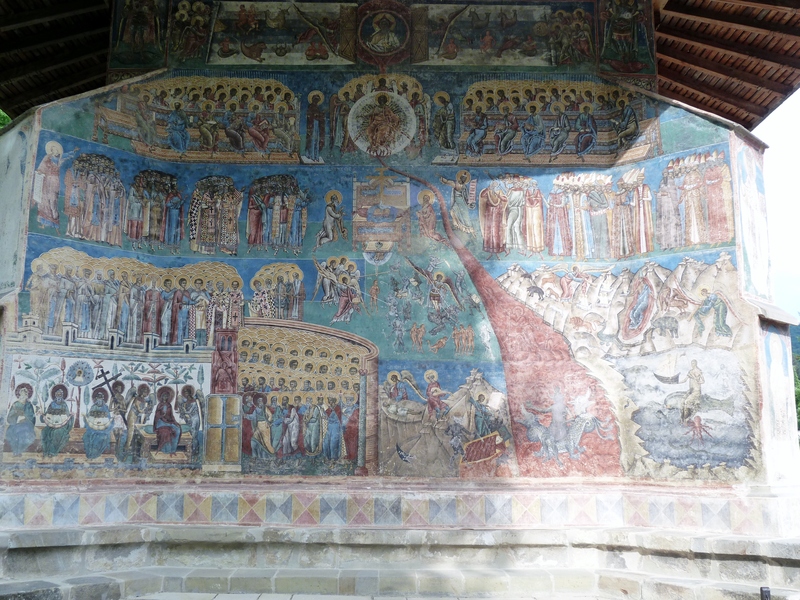 This representation was present at all the monasteries we visited but the one at Voronet was the most spectacular. The whole façade with the side buttresses create the impression of gates opening. 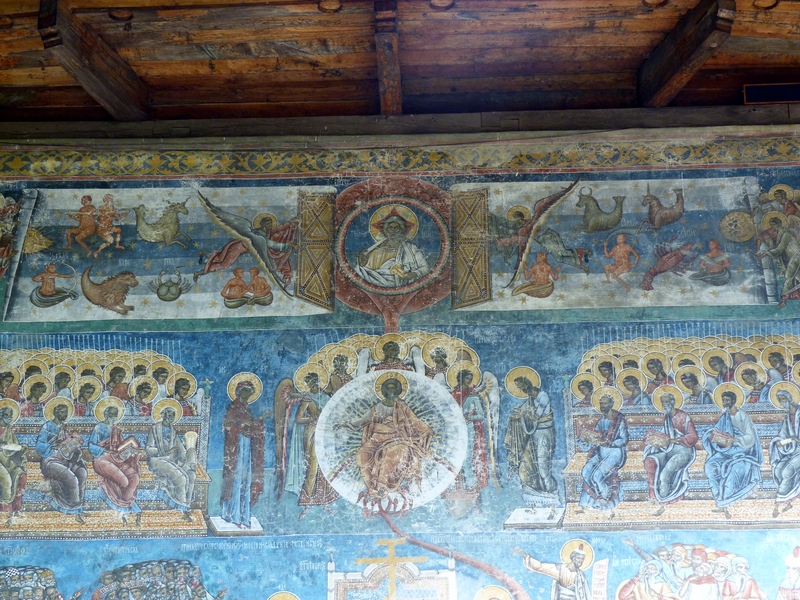 This mural subject was particularly emblematic for mediaeval spirituality in general and in Moldavia in particular during the 16th century. Starting at the top under the cornice ‘The Old of Days’ appears at the end of the world from the heavens while the Angels roll a scroll with the signs of physical time which ends up on the doorstep of eternity. Beneath this, ‘Christ The Righteous Judge’ seated on a rainbow in the centre of the group called the Deisis, starts The Judgement. 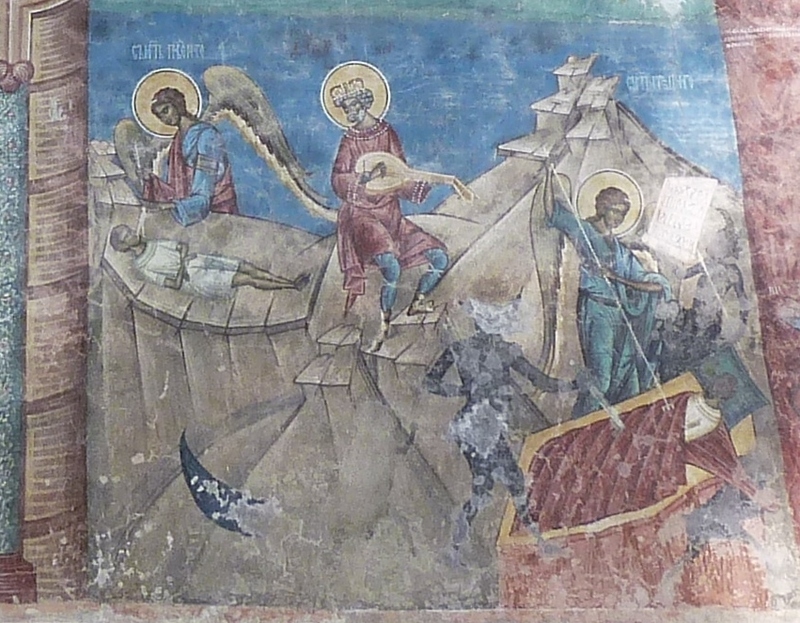 The Righteous are ordered in groups lead by the Apostle Peter towards the ‘Gate of Heaven’ (shown at the bottom of the mural), guarded by a Seraph. 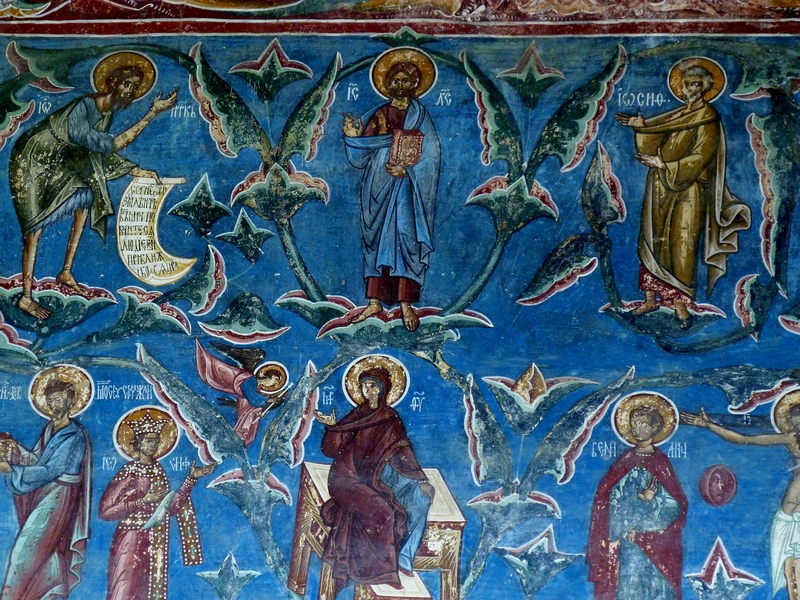 Heaven is painted with a white background at the bottom left of the mural and has the ‘Tree of Knowledge’ in its centre, in whose branches appears ‘Christ – The New Adam’. 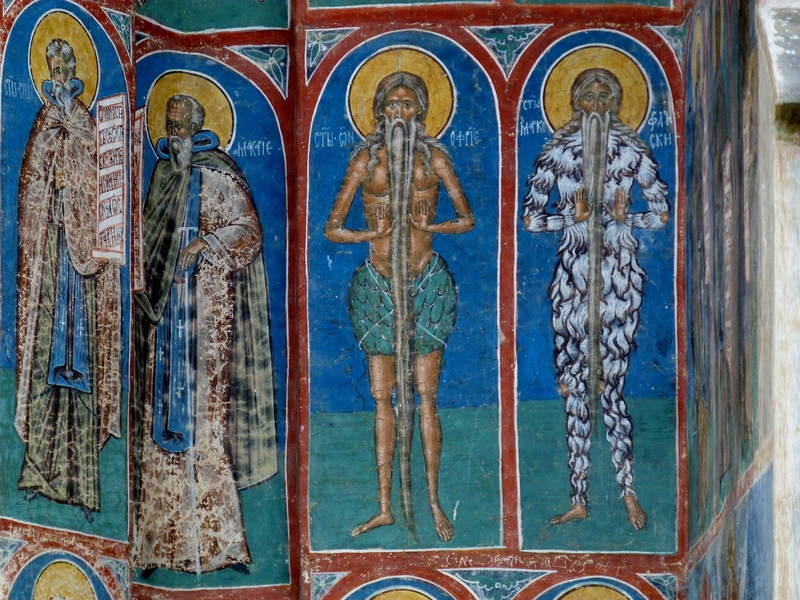 The figures in Heaven represent The Holy Virgin, Patriarchs Abraham, Isaac and Jacob and The Good Thief. 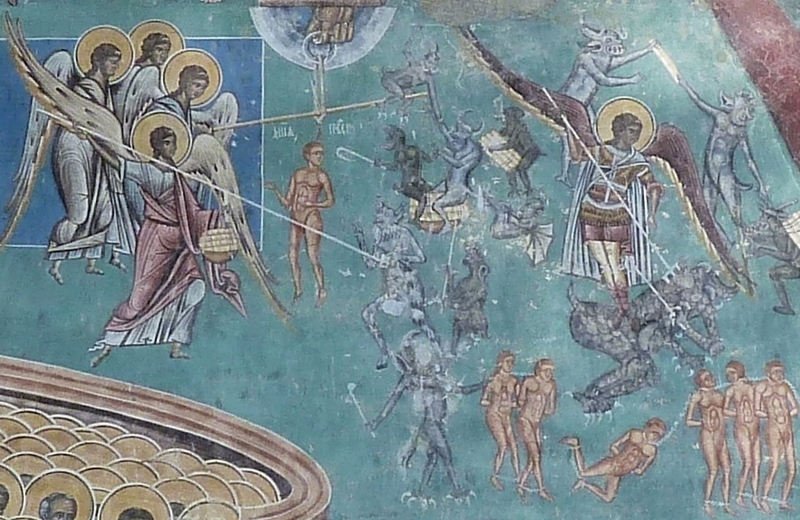 In the centre of the mural beneath the Throne of Hetoimasia, the Archangel Michael weighs souls while Angels and Devils fight for them. From the feet of the Righteous Judge there springs ‘The River of Fire’ swollen at the other end by the Leviathan Monster. In the red whirl of the River are the great sinners; emperors who persecuted Christians, heretic Arians and others. 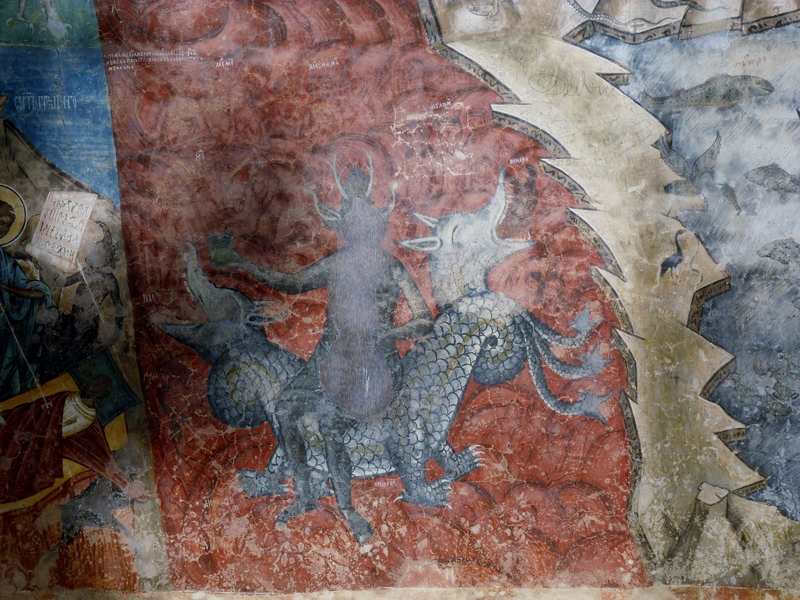 The River of Fire is guarded by a jubilant Satan. On the third tier down on the right Moses leads the non-Christian people to the Judgement. Below this to the right of the River of Fire is ‘The Resurrection of the Dead’ represented by the elements of nature, The Air, The Earth and The Sea, each liberating the bodies that in time died or were buried through or in such elements. Finally at the base just to the left of the River of Fire is ‘David The Poet King’ playing the lute by the head of the dying ‘Poor’ whose soul is received into the hands of an Angel. This image is present to give hope and joy to the observer. 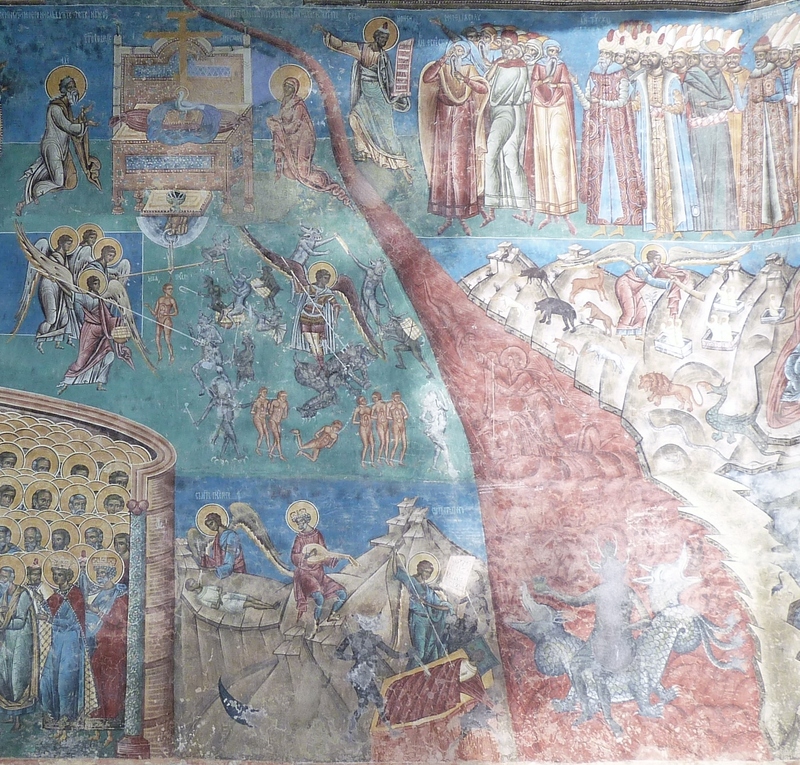 I think that one of the most beautiful murals at Voronet is ‘The Tree of Jesse’. This has an intense azure blue background and elegant volutes of palmed leaves and flowers showing the lineage of Christ from Jesse, father of King David, from whose body springs The Tree, to the Holy Virgin and Christ himself. 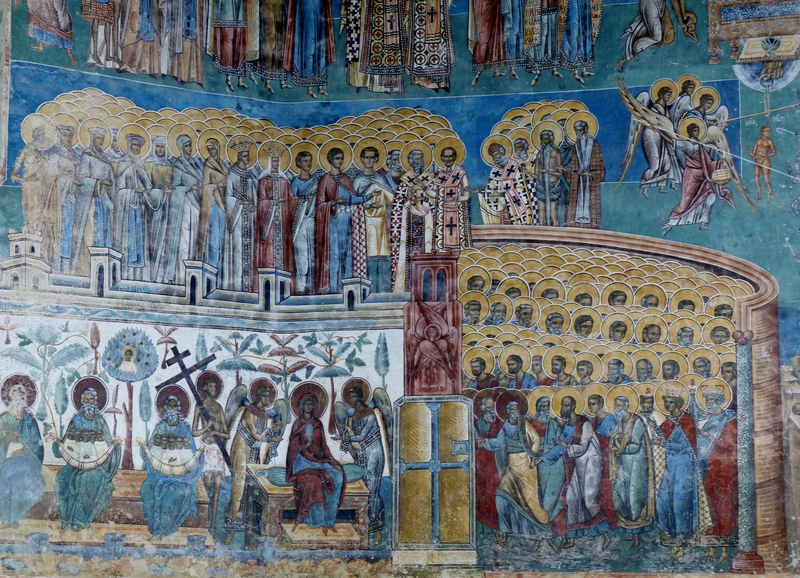 To the sides of this mural appear Patriarchs, Prophets and Kings of Israel. 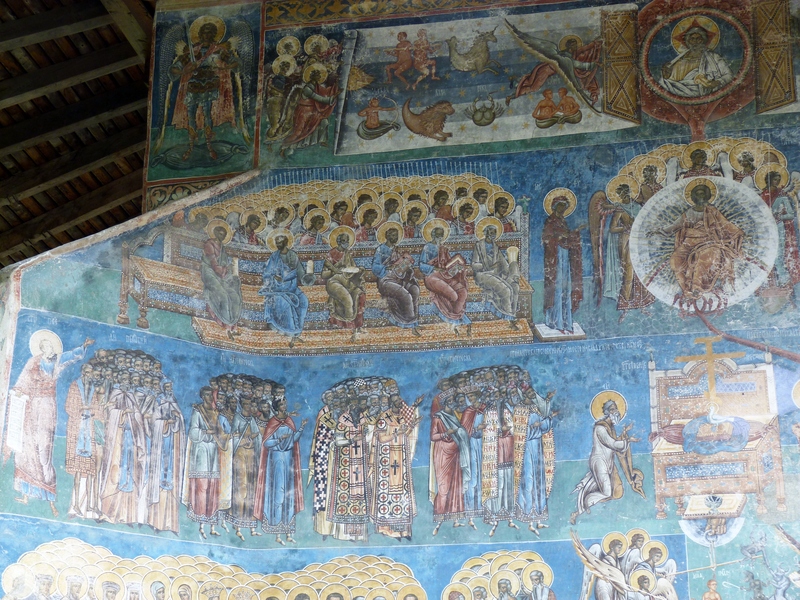 Of course no blog about the Painted Monasteries would be complete without mentioning the Martyrs. Some of the scenes depicted should be X-rated and are not for the faint hearted. 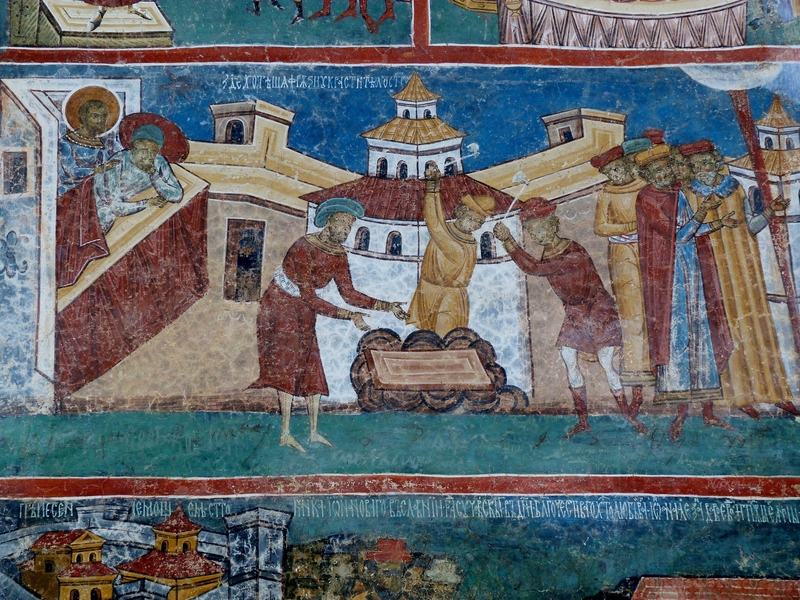 Voronet is dedicated to St. George and part on the front wall shows a series of murals about the martyrdom of St. George. The other monasteries are also keen of the subject of martyrdom and particularly favour pictures of saints being burnt or boiled.